We arrived at the Charles de Gaulle Airport (CDG) in Paris at 11:30 am on May 1st and sat in the outdoor waiting area at the airport train station for our train to arrive – the weather was nice, but breezy. We climbed aboard the TGV around 3:00 pm and were whisked through farm country and hilly areas to Avignon in Provence where we arrived at 5:20 pm. After 18 hours of plane, train and automobile, we finally arrived at our hotel in Les Baux de Provence, the Auberge de la Benvengudo. This charming property was at one time a family home and is till run by the family. Our rooms were lovely and we dined here several nights. The proprietress, Maggie, was an absolute delight and I would stay here again any time! We started our villa visits on Wednesday with a break for lunch in a different village each day. This was a wonderful arrangement as it gave us all a chance to enjoy the village atmosphere and have an introduction to some of the better restaurants in each village. Of course we would be delighted to pass these little treasures on to our clients! 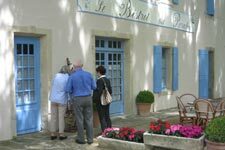 Our first lunch together was in Paradou at Le Bistrot du Paradou. Here they serve one menu to everyone. Talk about authentic Provencal style dining. The main course of the day was rabbit and it was my first. It was delicious! Also the stone building that we dined in and the décor of the dining room was the perfect example of French countryside dining, complete with characters. The weather was very cool and rainy for all 3 days that we did villa visits. The villages of Les Baux, Maussane, Fontvielle and Paradou were like little ghost towns. Hardly a soul was about. One evening, after leaving Mausanne quite late, we decided to try a restaurant in Fontvielle. We walked into the village and looked into 2 or 3 restaurants to measure the atmosphere and check out the menu. There was NO ONE in these restaurants, a bit spooky. So finally we decided on Lou Claveu, the tiniest of them all but loaded with charm and atmosphere. Just after we arrived, another couple came in and within 30 minutes the place was full! I do not know where this many people came from! But I think we started the trend for the evening! The food was quite good. Lidy and I started with escargot and finished with a filet of sole provencal. The villas were totally amazing! Something for everyone! I really enjoyed the villas that were located in the villages, like CEN MST and in Mausanne and CEN MCO in Paradou. Here one can enjoy the village life - shopping for groceries, having a leisurely lunch or an impromptu dinner with friends. Then do your exploring as you wish! There were also some absolutely marvelous places in the countryside. 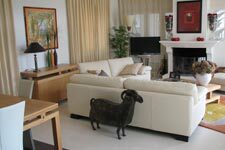 Some of my favorites were CEN ESP, very modern, so tastefully furnished, and only 5 kms from the towns of Les Baux, Mausanne and Paradou. With 3 bedrooms, it's perfect for couples or a small family. Mas du Chat is another good example, also a 3 bedroom, it is beautifully decorated! It is a little more remote, but a great villa for 2 couples - fantastic kitchen! La Louisianne (Coming soon!) is a new villa this year and is a wooden plantation style. As we approached it we were all set to dislike it, just because it was so different. But then you walked around the grounds and stopped to enjoy the view and it suddenly became magical! CEN PIN, just outside of Les Baux was a gorgeous villa all in white. Again a magnificent kitchen and lovely view. This 6 bedroom villa has everything a family or group of adults could want. 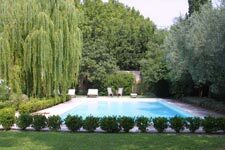 CEN LAV is another small and sweet villa with 3 bedrooms and just 5 minutes drive to St Remy. The gardens and pool and the view of the mountains in the distance painted a beautiful scene. And my two top, top favorites were a new villa called CEN CON just 5 minutes from the village of Eygalieres and CEN SOR near Il Sur la Sorgue and Le Thor. Both villas are furnished with the most exquisite taste. Mas de la Contemplation is very traditional and Mas de la Sorgue is more modern. They both stand out as pure perfection. The gardens, the location, the view, the pool ... everything! Although it rained almost the whole time we were in Provence and quite hard some of the time, it is a very beautiful area with vineyards, olive groves, small villages, large towns with historic centers, and many cafes and restaurants. We enjoyed seeing the Roman aqueduct ruins near Fontvieille, the coliseum in Arles and passing the Roman ruins at Glanum. I would like to tour Glanum and Les Baux next time and to spend more time in the hillside village of Eygalieres. We had some evidence of Le Mistral – the winds that blow relentlessly from time to time in Provence – we were told they do not blow as much in the Luberon area as the hills deflect them, but that's not what Peter Mayles said in his "A Year in Provence."